If you are looking to make something just a little bit different, a little bit more special, for Valentine’s gifting or decor? How about the beautiful crochet hearts fastened onto the jars below? They make such beautiful decorations for the mantlepiece or for the table even without flowers. 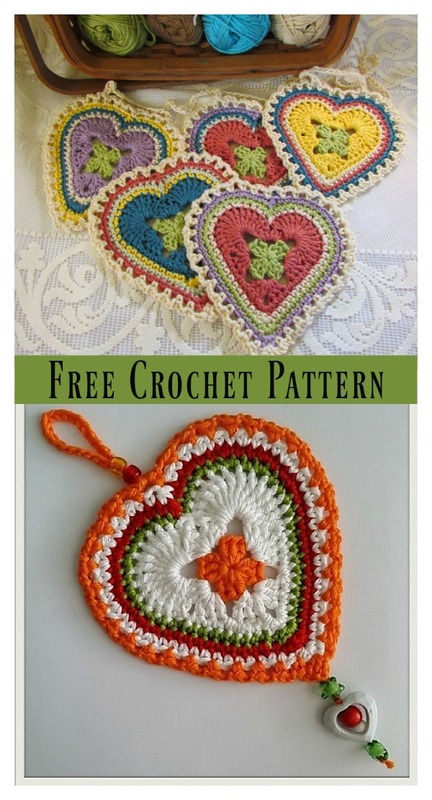 This Granny Heart Free Crochet Pattern can help you make your own crochet granny hearts. They are not only perfect for Valentine’s day, but also could be used all year long. You can use them as coasters or attach them on a tie for cute wall buntings. The list of uses goes on. Thanks Anabelia Craft design and Nancy Drew Designs for sharing these free patterns. The links for the free patterns are provided below photos. Happy crocheting. You might also like Weaving Danish Heart Free Crochet Pattern.